The candy cane colors you're planning for your baby's crib might look good enough to eat, and that's a problem. If your toddler decides to take a bite out of a rail or spindle, you don't want him to get a mouthful of toxic chemicals. 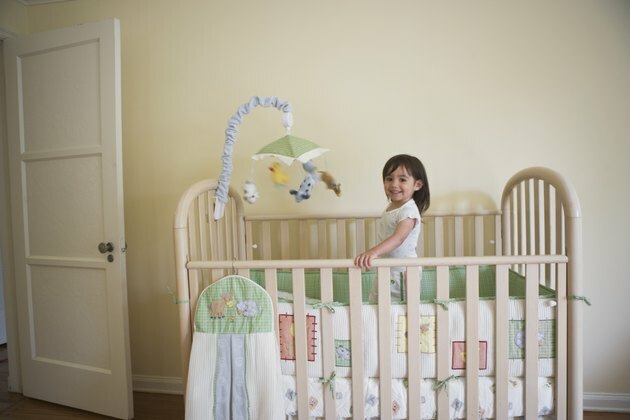 To paint a crib safely, you need materials that emit few or no VOCs and contain no harmful pigments, binders or harmful chemicals, such as mildewcides. Among the baby-safe paints available, milk paint probably ranks number one in terms of safety, and it's available in a variety of earth-tone and vibrant colors. The main ingredients in milk paint are milk protein -- or casein -- and lime. Other choices include chalk paint, clay paint and paints made with other natural ingredients, such as citrus oil. Low-VOC latex enamel is also baby-safe, as long as it doesn't include biocides. It isn't as easy to find non-toxic wood stains, but you usually don't have to -- stains typically get coated with a clear polyurethane finish, which is non-toxic when it dries. If you're repainting an old crib that has already been painted, it's important to test the existing paint for lead; the dangers of lead weren't well-known prior to 1978, and older finishes often contain the toxic element. If you find lead-based paint on your crib, you can deal with it in one of two ways. The first is to strip the old finish completely; collect the stripped paint and dispose of it as hazardous waste. The other option is to get a new crib. Painting over lead-based paint isn't a safe way to deal with it; your toddler could easily scrape off the new paint and bite into the toxic paint underneath. Move the crib outside to strip off the old finish-- if necessary -- and apply new paint or stain. Even if you use a low-VOC product, a certain amount of off-gassing occurs until the paint dries, and the gases dissipate faster outside. • Spread dropcloths or newspaper on the ground and strip the old finish with a citrus- or soy-based stripper. This type of stripper works more slowly than those that contain methylene chloride, but it's safer for you and your child. • Rinse the wood with water after scraping off the stripper and wait for it to dry. • Sand the wood with a progression of increasingly finer grits of sandpaper, starting with 100-grit and finishing with 150-grit. Once you're down to bare, sanded wood, you can apply a stain by brushing it on and wiping off the excess with a rag. Follow this coat with at least two coats of clear polyurethane. After the clear finish hardens, which takes a day or two, it's completely inert and non-toxic. If you choose to paint, apply two or three coats of water-based paint with a paintbrush or a sprayer. Latex paint takes about the same time as polyurethane to harden and become safe for your baby. Other types of paint, such as milk or chalk paint, are safe as soon as they dry tack-free.